Pro Tip: "The Ambush bait station has received a perfect score for child and dog resistance. Bell Labs really hit a home run on this station. It's affordable and easy to use. You will find good choices of bait under "related products". 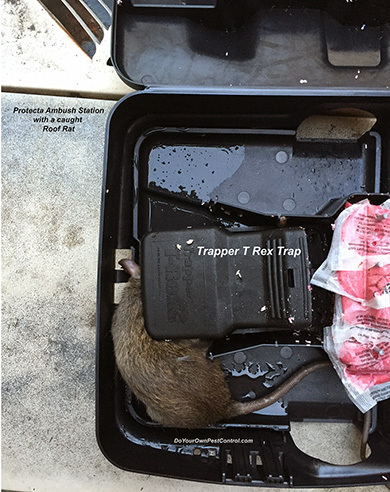 The Ambush bait station outfits the Trapper T Rex rat trap perfectly (see image of the Roof Rat caught)." Like Bell Lab's Protecta LP, Protecta Evo Ambush Bait Station's low profile allows use under pallets or other tight spots where rodents would travel. As a low profile bait station, Protecta Evo Ambush Bait Station works well in tight baiting scenarios, "ambushing" either rats or mice using rodent baits or Bell snap traps. Ambush Bait Station comes with 4 vertical rods with locking rods that will not fall out during cleaning. Ambush Bait Station is easily opened with a single key. Bell Lab's Protecta Evo Ambush Bait Station's low profile allows usage under pallets or other tight spots where rodents would travel. As a low profile bait station, Protecta Evo Ambush Bait Station works well in tight baiting scenarios, "ambushing" either rats or mice using rodent baits or Bell snap traps. The Ambush bait station protects rodent bait from dirt, moisture and contaminants keeping if fresh longer. As a tamper resistant rodent bait station, it can not be opened without a key. It has baffles in it to keep both bait and traps out of reach of pets, children, and non-targeted animals. This bait station has been tested to resistant against destruction by dogs and children. Protecta Evo Ambush Bait Station comes with 4 vertical rods with locking rods that will not fall out during cleaning. Bait is not included with just the bait stations. We have the following kits with rodent bait combined to save money. Easy to lock with a single key makes the Protecta Evo Ambush Bait Station convenient, providing a high level of security of tamper-resistance. This tamper-resistant bait station can only be opened with a key, keeping your pets and children safe. It also is designed with deep baffles, keeping the bait or traps inaccessible to children or non-targeted animals. The Ambush Bait station holds bait and allows room for the T Rex Snap Trap or Mini Rex Snap Trap. This provides an integrated approach in rodent control. The Ambush Bait Station is compatible with the Sidekick Load-N-Lock Base. Rodent bait is not included, may be purchased separately. Made of heavy duty injection-molded 100% recycled plastic. The Ambush bait station has received a perfect score for child and dog resistance. Bell Labs really hit a home run on this station. It's affordable and easy to use. You will find good choices of bait under "related products". The Ambush bait station outfits the Trapper T Rex rat trap perfectly (see image of the Roof Rat caught).